Artists on the Wards (AOW) is a program for patients and families at the University Hospital and Alberta Heart Institute that brings music, literary and visual arts to the bedside of acute care adult patients. Run by the non-profit organization, Friends of University Hospitals (Friends), the program uses the arts to meet the Friends mandate of enhancing well-being in the hospital community. The main goal of AOW is to provide stress relief which helps lower blood pressure, reduce cortisol levels and increase brain function. But AOW also strives to provide patients opportunities for socialization, to reconnect with positive emotions, build self confidence, and to provide independence and control over the environment. 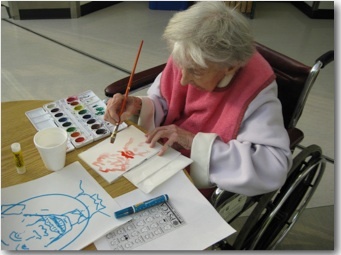 Although it is not specifically directed towards hospital staff, they also benefit from the program by enjoying the music, hearing a poem or participating in an art project when time allows. Overall, AOW helps to create a more positive and uplifting environment for staff, patients and their families when they are at their most stressed, frustrated and/or depressed. Five staff artists and a team of between 20 and 40 volunteers work one-on-one or in small groups with patients and families in areas such as Transplants, Orthopedics, Caridiology, Surgery, Neurology, Intensive Care, Dialysis and Psychiatry. Staff artists are professionals, accomplished in their chosen field with experience in facilitation/teaching and must be flexible and resourceful with strong interpersonal skills. Our volunteers, who are mentored by our staff, must meet minimum skill requirements in their artistic practice and have excellent communication and interpersonal skills. The staff component of our program ensures continuity and stability as well as providing artistic excellence. The program is administrated within Friends 'Arts in Healthcare' program (which includes operation of the McMullen Art Gallery, management of the 1400 piece hospital art collection and the provision of workshops and other arts services). In their visits, visual artists encourage participation when a patient is able but also create with or for patients depending on their abilities. Mediums used include watercolor and acrylic painting, drawing, clay, collage, wire, printmaking and multi-media materials to create a wide variety of projects from mandalas to jewelry. 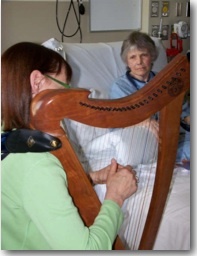 Musicians generally play music for patients though occasionally some will sing or play along. Music is performed in all different genres by request of the clients on instruments such as keyboard, guitar, harp, cello, violin, and flute. Our literary artists write for and with patients and their families. Reading and writing poetry, journaling or memoir writing, "Poetic Medicine" or simple "Thoughts for the Day" are all tools in the writers toolbox.